According to an in-depth news from the cnet, a 4K TV itself is the best free 4K UHD video converter and users don't need to buy additional upconverting BD player or receiver or 4K converter box. Is this right? Yes and no. 4K TVs coming with built-in scaler does a good job in SD/HD to UHD upconversion or upscale. However, you'd be wrong if you think that you don't need a 4K converter for TV anymore. A high definition video probably looks worse in a cheap 4K TVs after upconversion just because the built-in scaler isn't powerful enough. And some 4K videos possibly refuse to play on your 4K TV due to unsupported codecs or container formats. So, some of you may still need a 4K/Ultra HD video converter for TV, I mean software. Look at how a 4K video conversion tool for TV helps you watch videos including 4K UHD videos on TV smoothly. What's the best 4K video converter for TV? There're many choices ranging from freeware and paid programs. Don't be fooled by some free 4K UHD converting tools for TV that claim to fully support UHD but crash quite often and few can truly handle 10 bit HEVC transcoding, which is common for 4K. MacX Video Converter Pro, a go-to 4K converter that focuses on Ultra HD video conversion (processing) for TV, tops our chart. You'll feel very comfortable using the program. Look at its nice features and check if it will meet your needs. High quality. Its built-in High-Quality Engine makes it possible to output the best quality whether you use the software to upconvert HD to 4K or downscale 4K to 1080p/720p. Fast speed. We tested many UHD 2160p video converters for TV and found many of them stuttered or crashed halfway. 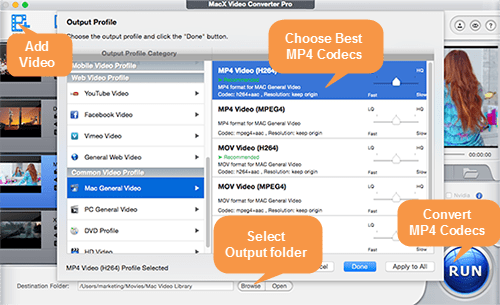 But MacX Video Converter Pro did 4K video downconversion/upconversion/processing job perfectly. It's the fastest among the programs we tested. Multi-core CPU processing, hardware acceleration and HT tech speed up the conversion process dramatically. Rich features. The tool can upscale HD to 4K UHD 2160p for 4K TVs and downscale 4K to 2K, 1080p, 720p for 1080p TVs. It can also add subtitles to videos, edit/crop/trim/split/merge videos, and change aspect ratio etc. Built-in 370+ video audio codecs. You can convert H.264 to HEVC/H.265, HEVC to H.264, VP9 to VP8, MKV to MP4 etc. and play any format on TV. Support any 4K TV models from LG, Sony, Samsung, Vizio, Sharp, Toshiba, TCL and more, including the latest 4K TVs. It's easy to use and it's available for both Mac and Windows (the latest macOS High Sierra and Windows 10 are supported). Step 1: Launch the Ultra HD video converter for TV on your computer, click "+ Video", select a source HD video or multiple videos, then the program will load the source immediately. Step 2: Choose an output format for TV on the popping-up Output Profile window. Some users may be confused about the file format. You won't go wrong with a universal format, MP4 (H.264), no matter what 4K TV you are using. Click OK if you've done with the output profile. Step 3: Now, you can see the source video info displayed here, including video resolution, length, subtitle info, etc. Click Settings icon to the right. This is where you can upscale HD video to 4K UHD. Find Resolution under Video Options category, click Resolution drop-down icon and select 4K UHD from the list. Click OK to save the settings. Step 4: Click RUN icon in the bottom right corner, and this tool will upscale one or more HD video files to 4K quickly. When the HD to 4K upconversion is finished, you can connect your computer to TV using HDMI cable, a DVI, or VGA cable or use USB flash drive etc. and play non-4K sources on 4K TV with sharp image quality. Tips: No enough 4K resources to watch on your 4K TV? The good news is that the 4K converter for TV can help download 4K videos from YouTube and many other 4K video sites. Also find more 4K movie titles to watch on Ultra HD TV. You won't benefit from 4K if you have a non-4K TVs. The source 4K video will be downconverted automatically to HD by the 1080p TV, however, you don't know how good it will turn out, maybe messed image quality. Not any 1080p TV models include 4K codecs like HEVC and VP9, so you possibly can't play 4K UHD video on 1080p TVs. You can use the 4K video converter for TV to downscale 4K UHD to HD for 1080p TV without noticeable quality loss. 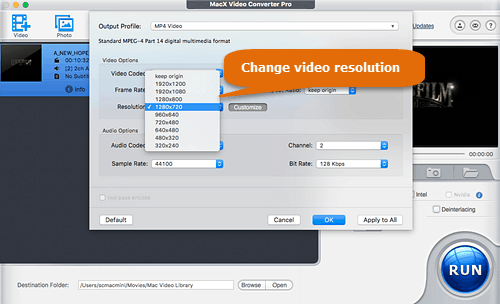 Video upconversion and downconversion for TV are quite the same using MacX Video Converter Pro - also a solid video resolution converter. On step 3 mentioned above, select 1080p or 720p under Resolution drop-down list to downscale 4K to 1080p for smooth playback on non-4K TV. About settings: The 4K converter for TV offers many settings when upconverting/downconverting video files, for example, bitrate, frame rate, subtitles, aspect ratio, sample rate, to name a few. If you don't want to deal with these settings, just skip it. The video is fine with its default settings. Or you can adjust the settings to meet your TV's requirements, but don't overdo it. The most common TV aspect ratio is 16:9 or 1.78 to 1. TVs don't have a universally accepted video frame rate, but 30fps and 60fps are the most common frame rate for 4K videos, while 60Mbps video bitrate is OK. There are tons of 4K TVs, like 4K TVs from Samsung, Sony, LG, Roku, LG, Vizio, Sharp, TCL, Panasonic, Philips, the list goes on (what's the best 4K TV?). Supported formats vary from models to models. Samsung 2017 4K TV model supported formats are slightly different from that on 2015 4K TV model. In case you are confused with file formats when using the 4K UHD video converter for TV, we enlist video formats supported by common 4K TVs. Video Container: AVI, MKV, 3GP, MOV, MP4, FLV, VOB, ASF. Video Codecs: H.264, HEVC, VP9, VP8, MEGP 2, MPEG-4, AVC, DivX. Audio Codecs: Dolby Digital, AAC, HE-AA, WMA, MP3, DTS. MacX Video Converter Pro can quickly upconvert HD to 4K for 4K UHD TVs and downscale 4K to 2K, 1080P, 720P for non-4K TVs without sharp image quality. Also convert among video formats, HEVC to H.264, VP8 to VP9, H.264 to H.265, MKV to MP4 etc. All TV models from LG, Sony, Panasonic, Samsung, Vizio etc. are supported. 2160p vs 4K, What's the Difference? What is 4K UHD upscaling? How does it work? Here's where to go to find content in 4K UHD. The best high quality video compressor for 4K UHD. How much space is needed for 4K UHD video recording.